South Africa Blog / Attractions and Places / Where is Dwarskersbos? Posted by: South Africa Bloggers 25 September 2017	in Attractions and Places, Explore Our Cities Comments Off on Where is Dwarskersbos? Along the western shores of South Africa, aptly called the West Coast, a myriad fishing villages lie sleepily as the Atlantic Ocean laps the sand and the breeze of the Cape blankets the settlements. This is the idyllic setting for the holiday resort of Dwarskersbos, a small fishing hub just 11 kilometres north of Laaiplek and about two hours outside Cape Town. Dwarskersbos was once a farm, named after the candle bushes (Euclea polyandra) in the area and belonging to the Smit family. As it grew, a residential area was added onto the family farm, and this eventually evolved into the little town of today. This part of the coast is made even more exquisite for the kilometres of white sandy beaches that lace the coast. Here, fishermen can be seen casting and reeling in for hours in the hopes of bringing home an admirable catch. Keen anglers can look forward to adding galjoen, snoek, bronze bream (hottentot), elf (shad), cob, eagle ray, steenbras, gurnard, grey mullet, and white stumpnose to their repertoire. The town is well-equipped for the visitors that come here to soak up the sunshine in a place of peace and quiet. 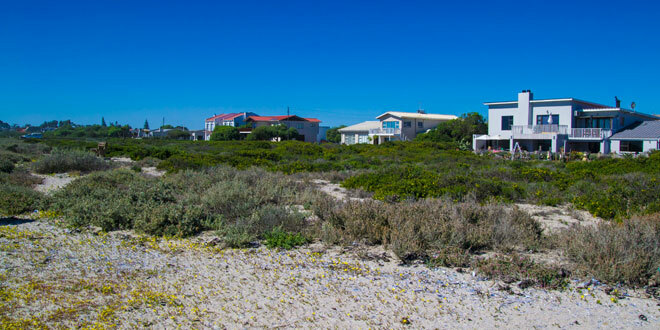 The West Coast has a number of guest houses and B & B’s available to its South African and international visitors. In addition, Dwarskersbos is home to a popular caravan park, which is occupied all year round by regulars and first-timers to this part of South Africa. The shaded caravan stands, good ablutions, bungalows and flats, and stunning views of the ocean make this an excellent choice for families looking for a scenic spot to enjoy their time off. Thanks to the breath-taking beaches, Dwarskersbos is a hotspot for water sports of all kinds. Those who have a passion for the water can go fishing, surfing, stand-up paddling (SUP), kite surfing, hydrofoiling, kayaking, body boarding, and swimming. The local dolphins often swim past and entertain the onlookers as they surf the waves and leap out of the water playfully. Then, between July and December, whales skirt past too, adding to the antics as they breach and lobtail for the benefit of the spectators. Dwarskersbos and its surrounding areas are also stunning spots for keen bird-watchers. There are more than 180 species in the Rocherpan Nature Reserve alone, which is only 10 kilometres from the centre of this town. Some of the most exciting of these species include the African hoopoe, black-winged stilt, African purple swamphen, black-headed heron, black-crowned night heron, sandwich tern, greater flamingo and Cape shoveler. Whale watching tours to see the humpback and southern right whales, as well as the occasional orcas. The Rocherpan Nature Reserve after the rains, when the pans are full and teeming with birds and spectacular vegetation. The West Coast National Park is home to caracal, eland and red hartebeest (amongst other species) and is fantastic for outdoors enthusiasts and wildlife photographers. 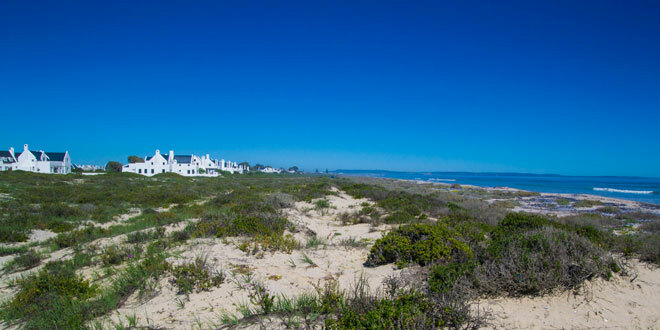 The Langebaan Lagoon and the beach, which are excellent for kiting and other water sports.